Who wants to pay higher dues? I don’t, but I can promise this, if we, as individual Community Granges do not initiate immediate sustainable growth we will be seeing frequent dues increases from both the National and State Grange. If we do not initiate immediate sustainable growth in each Community Grange and organize new Community Granges, our existing membership base will bear the entire financial burden of the National and State Grange in the future. Sister Jodi Ann and I just returned from attending the National Grange Session in Boise, ID and there were two particular resolutions that were defeated by the Delegate body I want to address with you. The first was a $4.00 per member dues increase to the National Grange; the other would have instituted an annual Charter Licensing fee. These were debated at great length, with State Masters speaking to both the pro and the con, but in the end it is clear that if we do not initiate sustainable growth a dues increase or fees of some kind will be necessary for us to maintain the National Grange. By the delegate body voting these items down it has only enabled each state to go home and institute ways of increasing revenues to National Grange. We can increase dues, but what does this really accomplish? A dues increase puts additional financial burden on our existing membership. I do admit we have the lowest dues of any organization I am involved in and many of you say the same. We have been short-selling ourselves for many years and now it is up to us to correct this situation. I can assure you if and when a new resolution is submitted to national Grange for a dues increase we will not be seeing $4.00 per member, it will most likely need to be nearer to $10.00. I am neither trying to make our National Grange out to be a villain nor am I advocating for a dues increase or any fees of any kind. Our National Grange belongs to us; therefore it is our responsibility to ensure its healthy well-being. The National Grange will not and cannot survive without our financial support and personal involvement. So, what can we do about this? Well there are some options. Option: We can support a dues increase putting the burden on our existing membership. Not the answer! Option: We can write a resolution that the National Grange mortgages our National Headquarters, but then WE, the membership, will have to repay that. Not the answer! Option: We can do nothing; we all know if you always do what you have always done you will always get the same results. For some I am sure this is the answer, sorry, not the answer!. What we can do, need to do, WILL do, is GROW our MEMBERSHIP! At state session I asked every Grange to make a pledge for membership growth. Some Granges made a commitment, some have not. 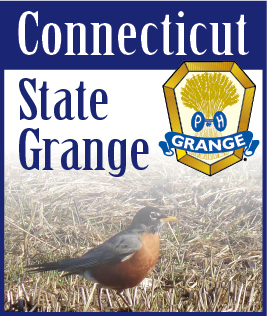 I am upping my challenge; I am challenging every Grange in Connecticut to increase their membership by 25% in the 2013 Grange year. Growth in these numbers is no longer an option, it is essential for our survival. I promise to every Grange that initiates measures to grow they will receive the FULL support of the Connecticut State Grange. Those Grange that choose to stay as you are, I wish you well, but understand this, the energy of this State Grange will ONLY be expended on what is important, and what is in the best interest of the Grange and Grangers. We will not be investing time, energy or financial resources in any activity that does not foster a positive environment. We cannot tolerate petty bickering in our Granges. We cannot tolerate a member that “controls” our Granges. We can no longer tolerate Granges not bringing in new members; self destruction is NO LONGER AN OPTION! By increasing our membership annually we will delay any need to implement dues increases for the foreseeable future. The increases we will then see will be necessary to support and sustain a larger membership. Increases that will be needed to improve and implement new programming; increases for ALL of the right reasons.